Trust is a hard thing to build, even with yourself. Here are five simple things you can do to build more trust in yourself and have the confidence to move forward with your choices. The first step to trusting yourself is learning to make decisions and sticking with them. Repeatedly committing to yourself and your choices is a sure way of proving to yourself that you can do it. Do it right now, make a small choice for yourself. Decaf or regular? Read-on or close this window? Blue pill or red pill? Don’t ask others for their permission, their opinion or their blessing. The choices you make have to be yours alone. If you regularly rely on others to validate you, you will never trust your own judgment. Additionally, you run the risk of living someone else’s life, rather than your own. Yup, you read right, FAIL. Take chances, try things you cannot guarantee you will succeed at, and fail. Why? Because you will come back from those failures, and every time you do, you’ll realize how capable, resilient, and competent you really are. This is one hell of a trust builder. Put your money where your mouth is. Practice making choices that come at a real (sometimes even financial) cost to you. Make sure these are choices that also have a payoff that is worth it. It’s too easy to make choices that cost you nothing. It doesn’t require any real commitment or trust to make a decision that is risk free. Want to build you self-confidence and trust? Challenge yourself by committing a bit more. There is certainly value in weighing all the pros and cons of a choice, but when you trust yourself and your gut, you realize that many choices don’t requires such a high level of scrutiny. One of the easiest ways of building trust in yourself is learning how to make decisions on the fly and trusting your gut. Start small, practice making basic, risk-free choices in under 30 seconds (what shirt to wear, where to eat, what movie to go to…). Don’t hesitate, just do it! Lack of confidence and trust in oneself is the one of the biggest reasons people feel stuck. When most of my coaching clients start their journey, their initial complaint is that they don’t know what they need to live better. Their hope is that I have the answer for them, when In reality, they are the ones who know what to do. Unfortunately, they don’t trust themselves to hold or find the answers, and if they do have thoughts about what to do, they don’t trust their insights. Learning to trust yourself, building insight into what you need and value to gain confidence in the choices you make is essential to creating the life you want. 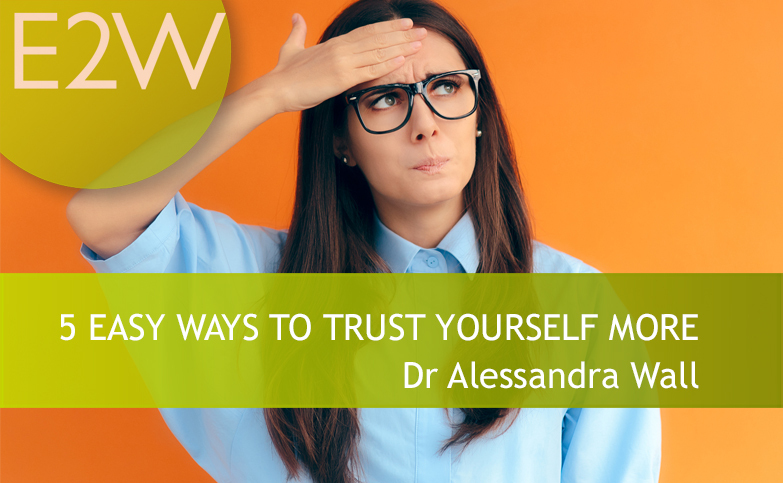 Dr Alessandra Wall, a psychologist and coach and now a guest contributor to E2W’s Blog and Newsletters. Alessandra is going to help us in our continued mission to support you in your career path by, over the next few months, contributing a series of articles surrounding career progression, managing work scenarios, overcoming self-confidence issues and other pertinent topics. Some of you may already know of Alessandra thanks to her social media presence, or you may have heard her speak.